Thinking of selling her after 2yrs 2 months. A combination of lack of space (single garage) and lack of use (3000miles). Any advice on realistic sale price would be gratefully appreciated as asking prices are all over the place. Not after slow top dollar sale and not intending to give it away either. 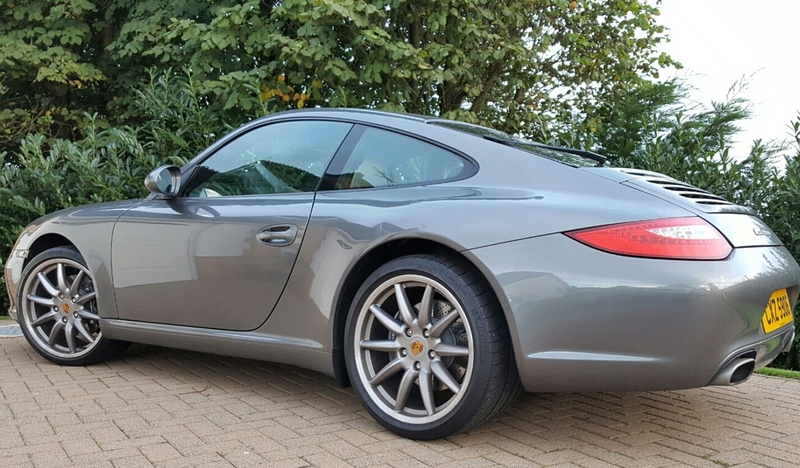 Meteor grey 09 c2 gen2 pdk 41k miles ... full opc service ... sports seats ... sport chrono ... carrera sport alloys ... all new tyres and brakes and exhaust shields / bolts 2yrs/3k miles ago. I bought it from opc and am the 3rd owner. Private sale, just a guess but ask 47k to take 44k? Lovely car! Just to give you an idea, I just purchased a Gen 2 Carrera on 47k miles for £35900.00 from JZM. Previously RSJ then OPC, so good pedigree. Three owners prior to me. All in fantastic condition. My car lacks the sports chrono and hardback seats you have plus mines a manual with no sunroof or rear wiper. Narrow body Carreras are quite rare in good condition and low mileage so maybe 35k if you can pass on an OPC warranty. That’s my two penneth anyway. Good luck with the sale, it looks v nice. Sure you want to sell as good Gen 2s are getting scarce? No way will you get near £44k for a private sale. When a dealer with a good reputation like RSJ have a 2s priced at £44k with similar miles I think you will be lucky to get a private punter to pay much more than £35k when you take dealer margins into account! I had £35K in mind as soon as I read this. Christ knows where the £44-47K is coming from*, that is approaching 991 territory surely. *presumably another 997.2 owner talking them up lol. Seems as I continued down the thread we are all , well except 1 thinking around the same money. Yes probably best to ignore my guesstimate! OP I think your looking at around 34k tops for a private sale in the current market, its the worst time to sell of course, which buyers will use against you. But as Phil says advertise it higher, buyers want to think they got a bargain. Personally I prefer the 3.6, its a better engine, but again it will put a lot of people off not being the 'S' despite the cars excellent spec. Bearing in mind the retail value, trade offers will probably be silly. Edit. On the plus side, the crazy priced low miles gen 1's are close, anybody clued up enough will take your car against a similar overpriced gen 1 ticking time bomb. Nice wheels and mileage in its favour. Non-S and no PSE. I’d put it up to sell at £33k. Advertising too high just kills off enquiries IME. Thanks for the opinions folks. Concensus seems to be circa £35k. As someone pointed out there does seem an anomaly when compared to 997.1's advertised for £32/33k by dealers. If we suppose dealer premium is say £5k then £27/28k private maybe does indeed make sense compared to gen2 private at £35k. Will give it more thought, ad it at £36k and accept £35k would seem like a plan. Anyhow if anyone needs a wildly optimistic and ludicrously inaccurate valuation on their car feel free to contact me! I'm with Magic919 on this one, i.e. £33k. Above this and you might struggle for takers. It probably depends how much of a hurry you're in to sell it. If you are prepared to wait then advertise it at £35k.